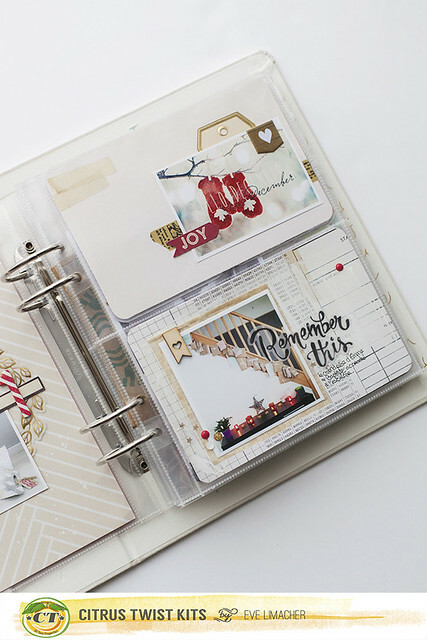 I have a big passion for mini albums, they are my absolutely scrapbooking favorites. I love it. 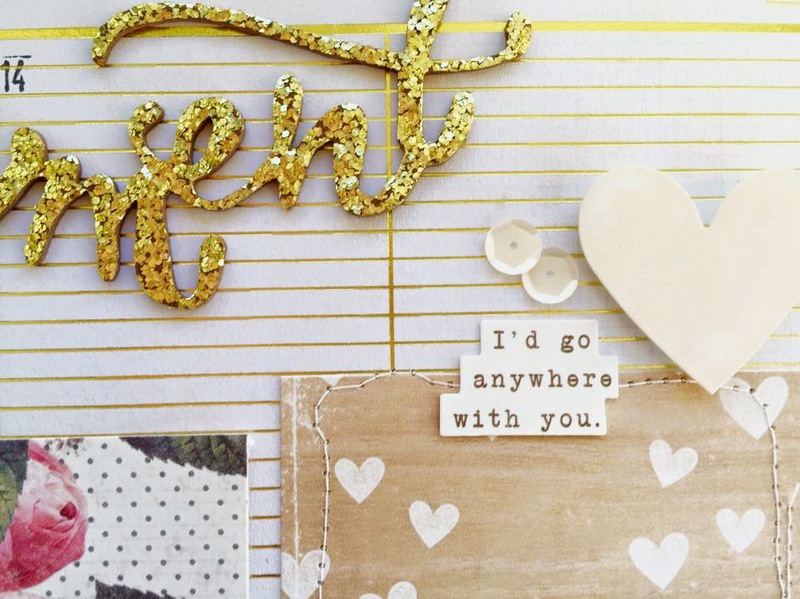 I like to create about the themes travel / trips, seasons, moments or favorite things. 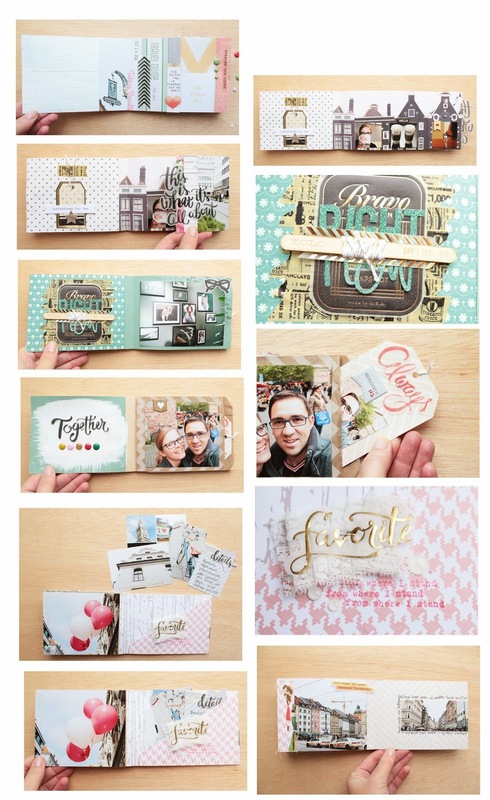 It gives you so many options for creating a mini album and I like it to look at it with my family. 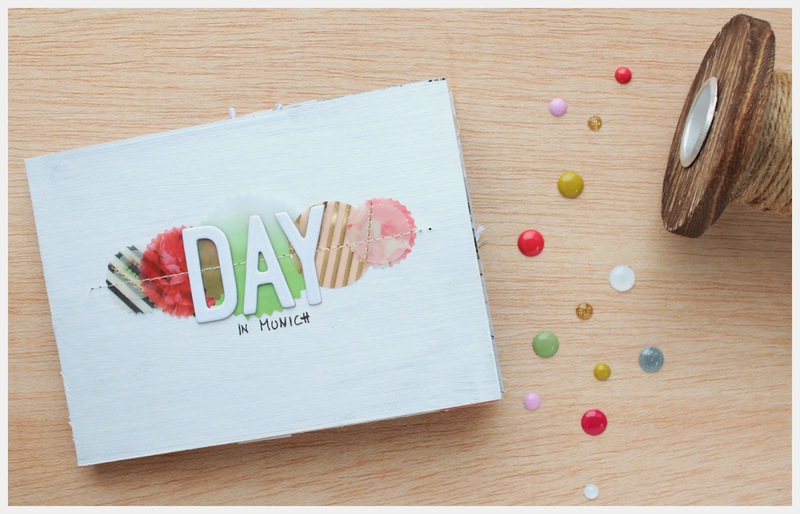 Therefore I will show you a tutorial about a mini album today which is easy and quickly to make. 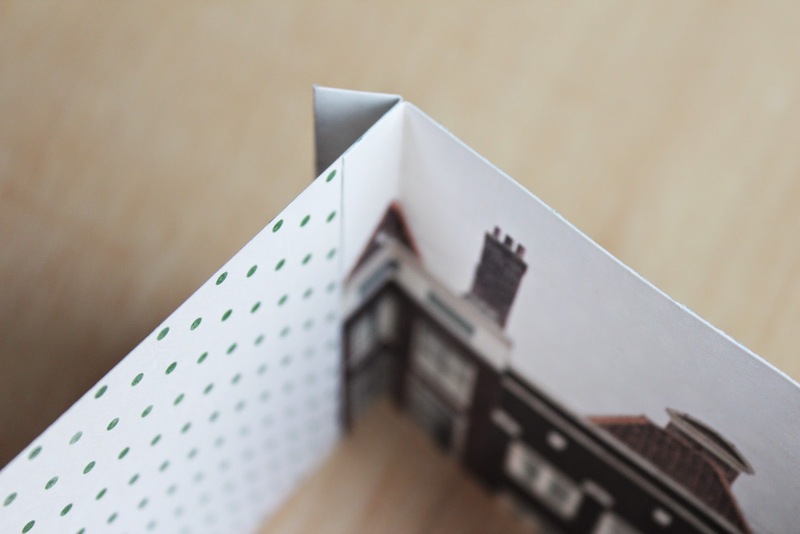 The album includes 6 double pages. With one folder and a pocket. So there is enough space for a lot of pictures. First I selected the papers which fits perfectly to the photos. I matched the papers to my picture because of the colors. I like it when all matches together in harmonically. Next I cutted and folded the papers. 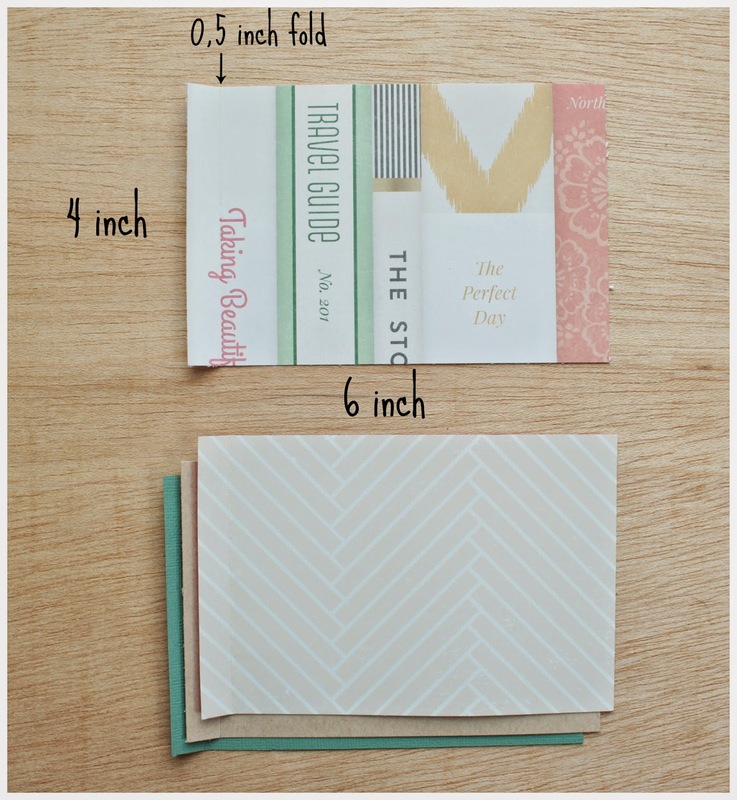 For the folder, you cut one paper to 4 inch tall and 9 inch across. 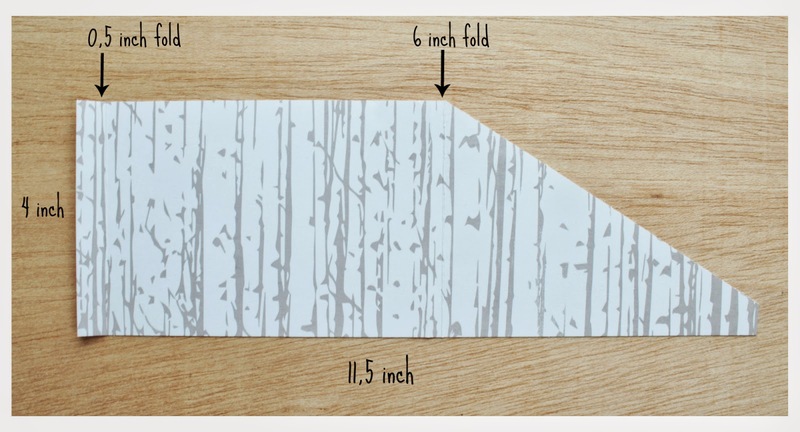 Next you fold the paper at 0,5 inch and 6 inch from the left. 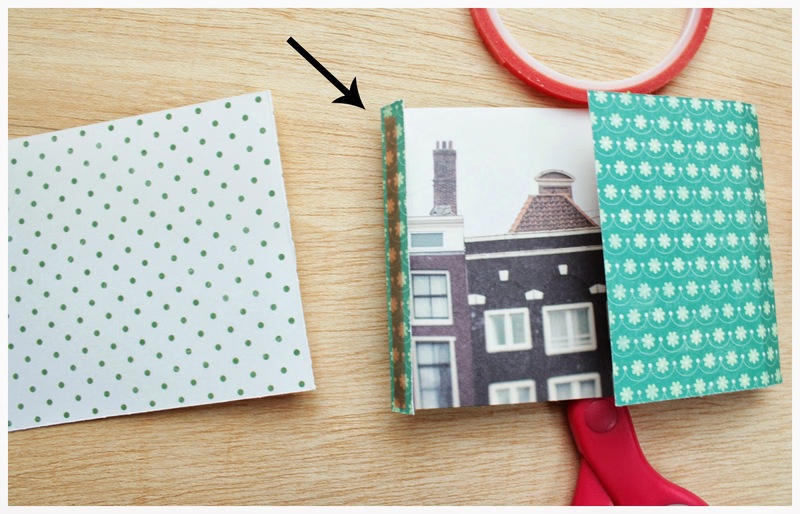 With the next paper we create a pocket. 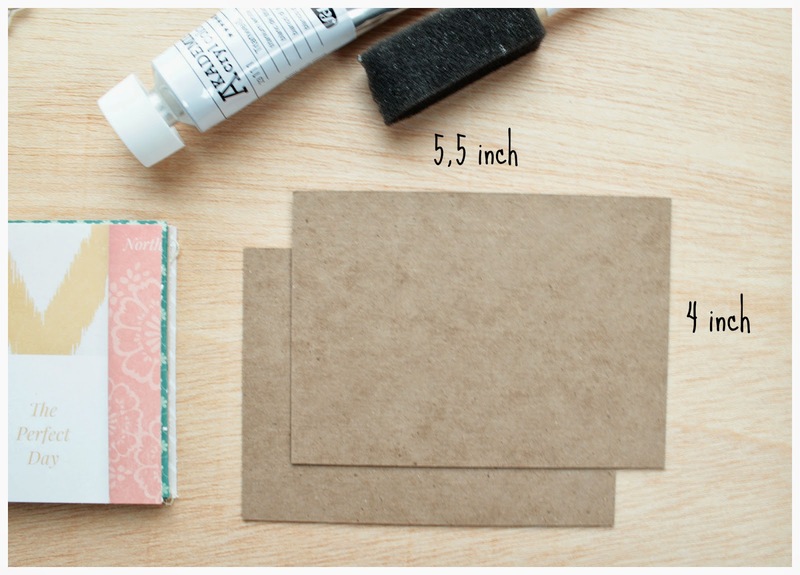 You cut the paper to 4 inch tall and 11,5 inch across. 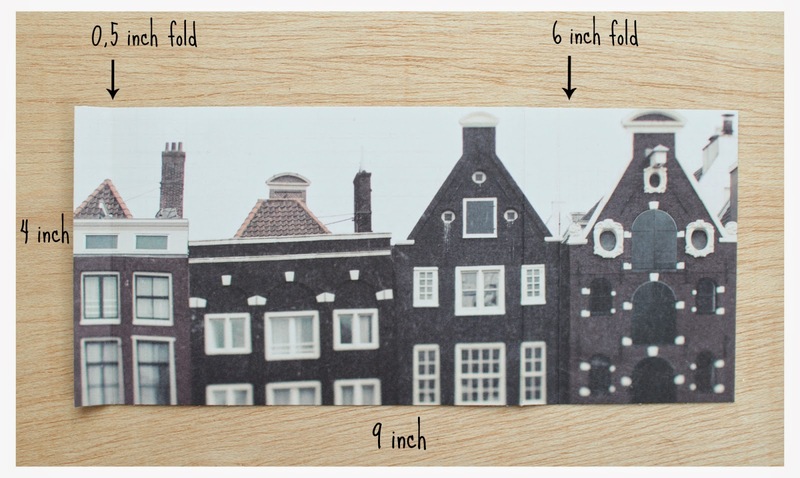 You fold the paper at 0,5 inch and 6 inch from the left . As seen on the picture you make a diagonal cut. 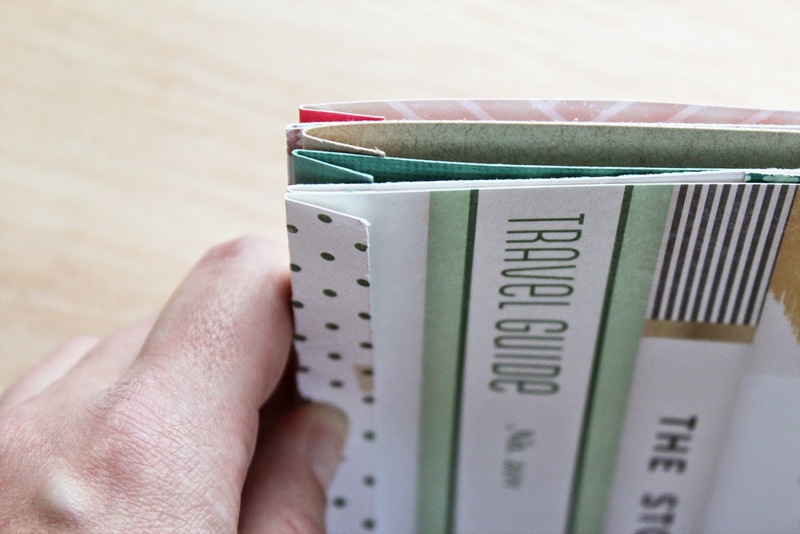 Now all papers are ready and you can put them together the way you want it. 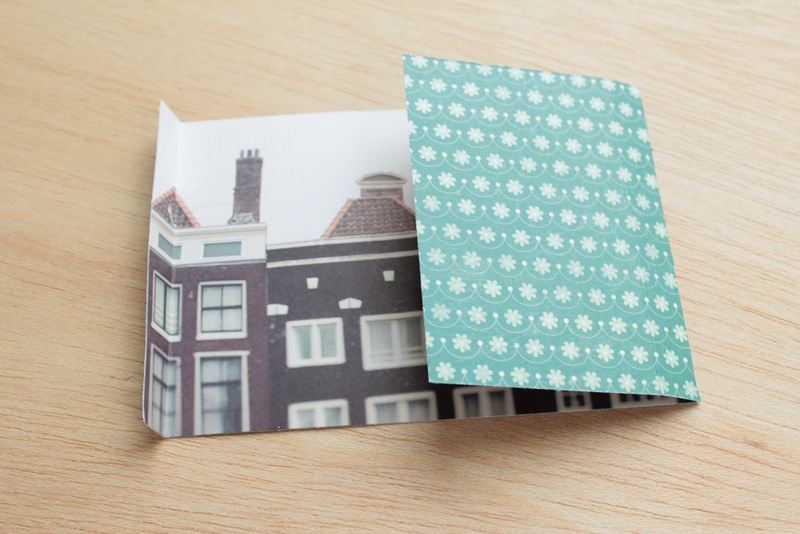 I glued the papers with double-sided adhesive tape. 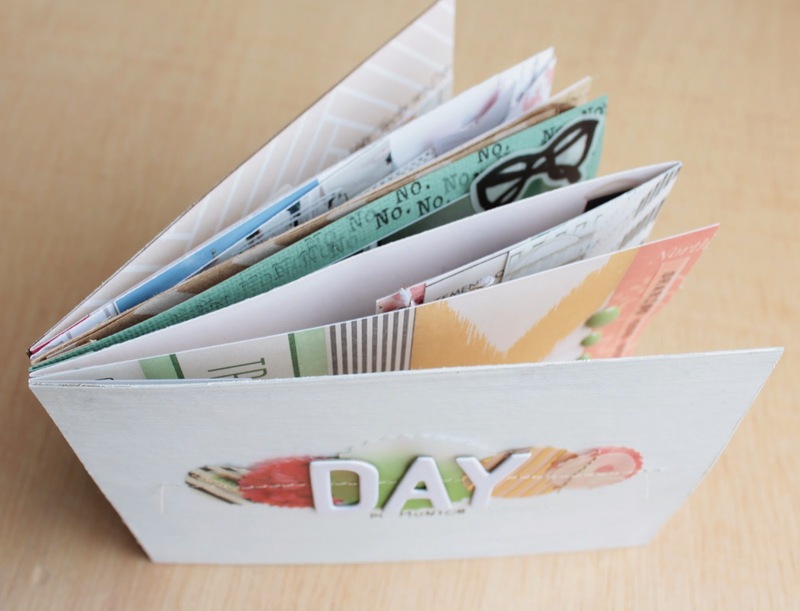 Put the tape on the outside of the paper and glue it together with the previous page. For the cover I used the brown cardstock from the kit and cut it for the front and the last page to 4 inch tall and 5,5 inch across. 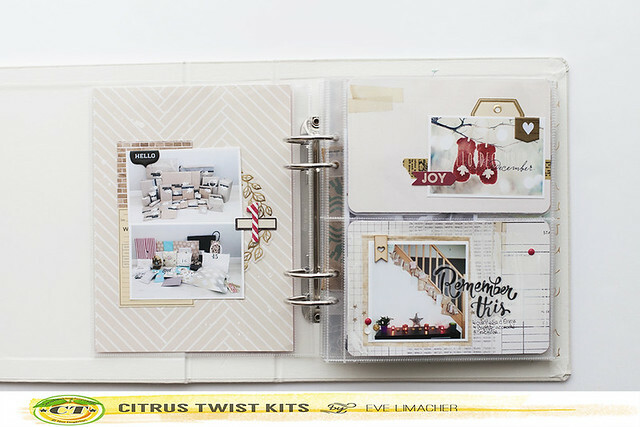 I painted these with white acrylic color and I glued the cover on the pages. 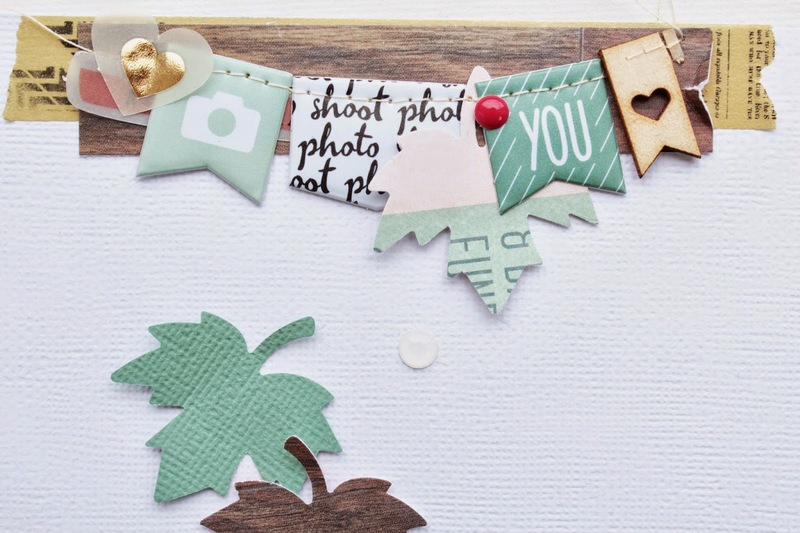 Now you can fill your mini album with photos, embellishments, tickets. And here is my complete mini album. I made this with some pictures from a great day in Munich. 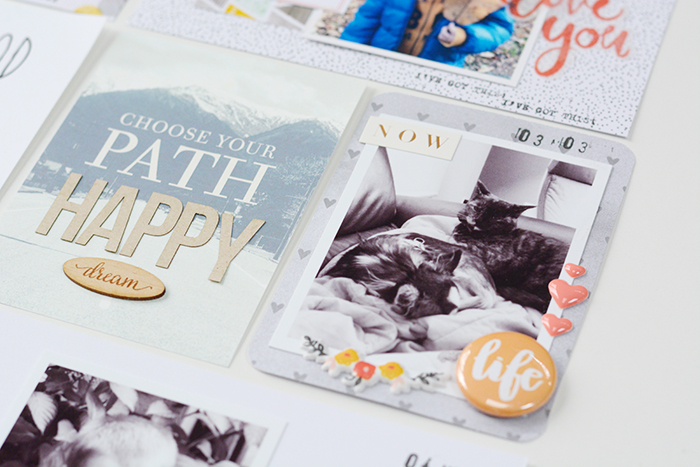 Subscribe today--or during the month of January--while supplies last and get a free kit with the first kit in your subscription. We'll select a kit for you. New Pocket Life subscribers will get a recent PL kit. 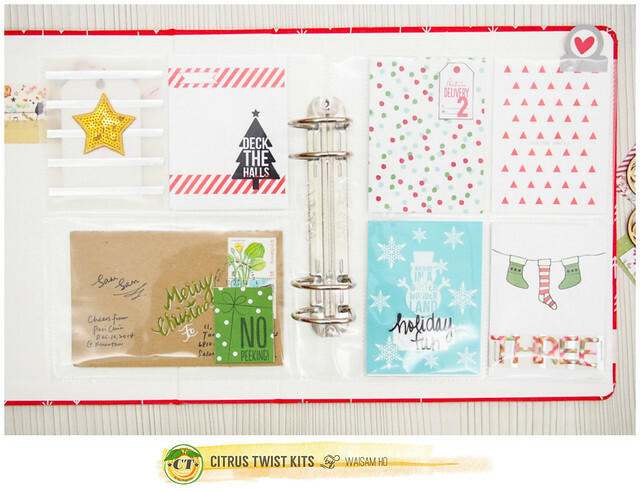 New Main kit subscribers will get a recent Main kit. Are you ready for sneaks? 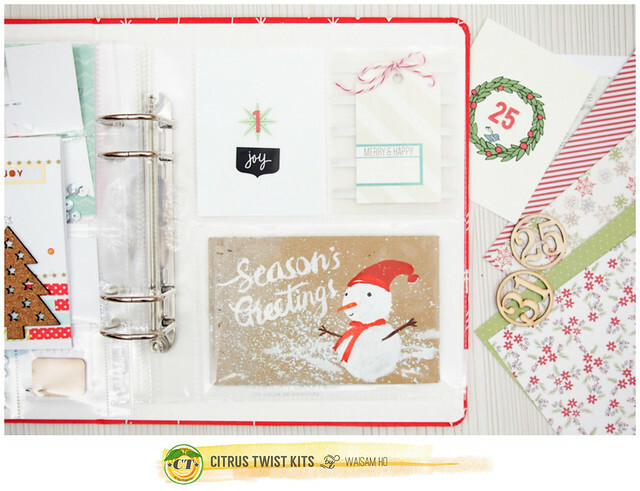 We'll start off with photo sneaks of our January Main kit, brought to you by our Design Team 2015 and January guest designer, soon to be revealed on the Citrus Twist Kits blog. 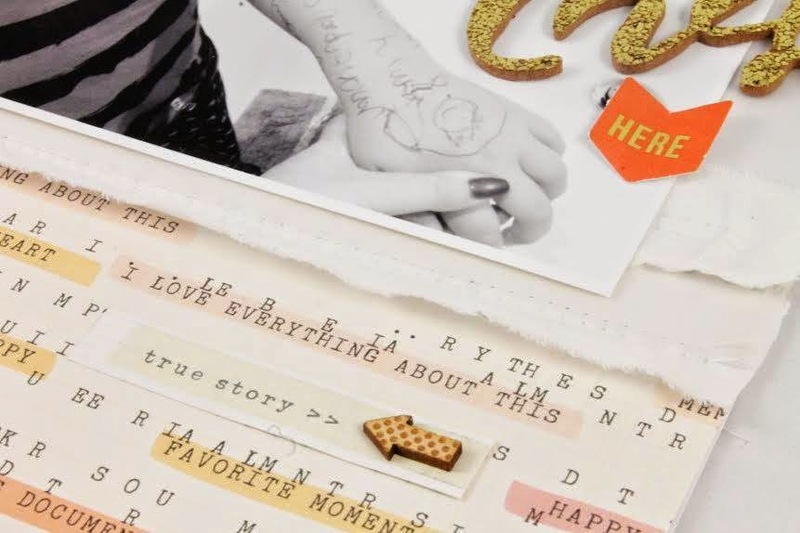 These sneaks also use a little from the January Embellishment kit. Be sure to check out our January subscriber presale on our website beginning at 10 p.m. PST on New Year's Eve. We look forward to seeing you during our subscriber presale (December 31st, 10 p.m. PST) and full reveal (January 1st, 10 p.m. PST). Happy New Year! 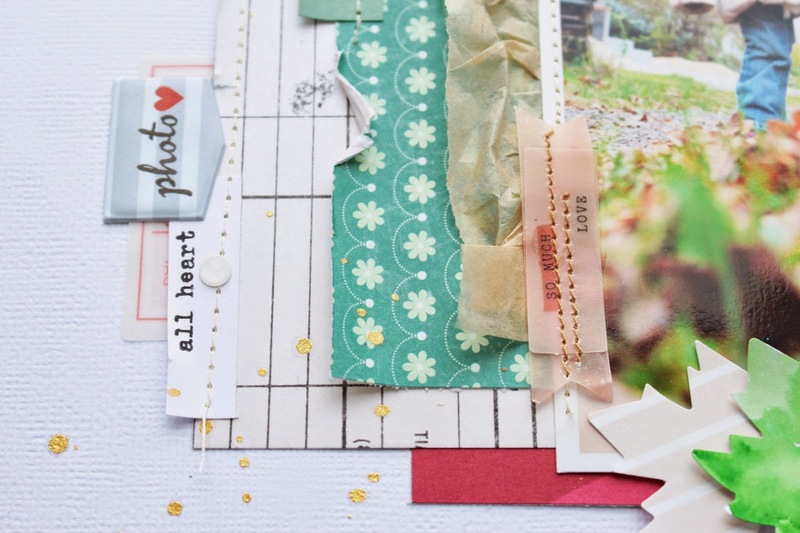 Do you save some time to scrap in between Christmas celebration for a little alone time in the scrap room or are you planning to make a fresh start after New Year ?? I am one of them who likes to sneak down to my scraproom in the basement to escape when the kids get Christmas cabin fever to create. 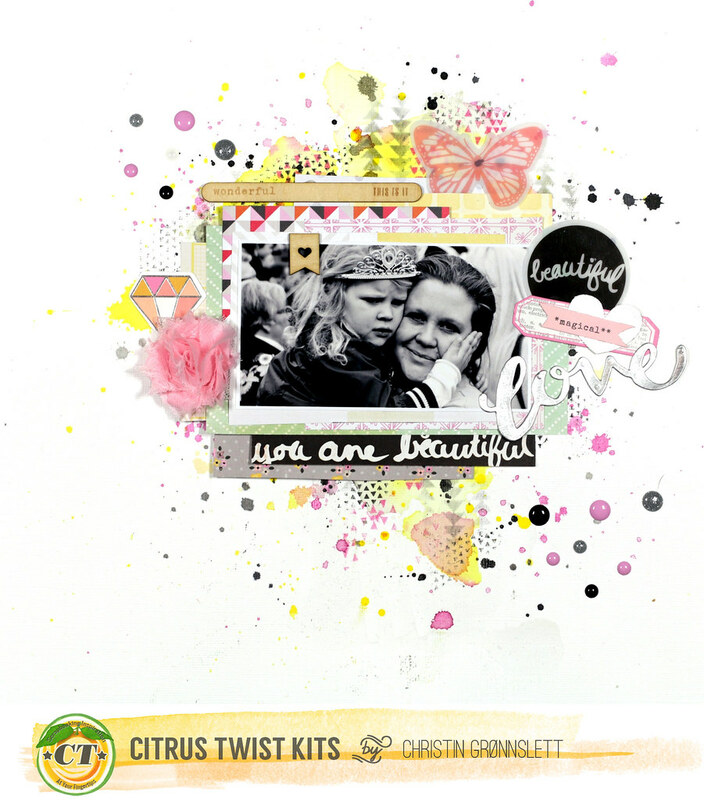 I got the create with one of my favorite colors this month - pink found in the December 2014 Crazy Beautiful Add On Kit. 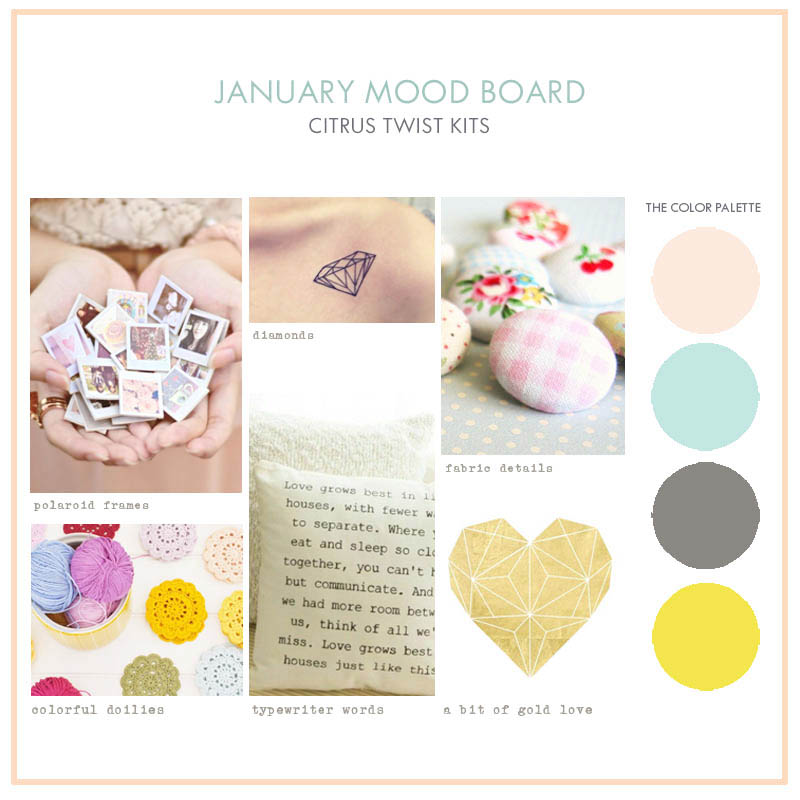 The mix with pink and grey can't go wrong. As usual I have made a background with drops of mists painted with watercolors or just drops to complement the colors of the kit. The mists are great that way. 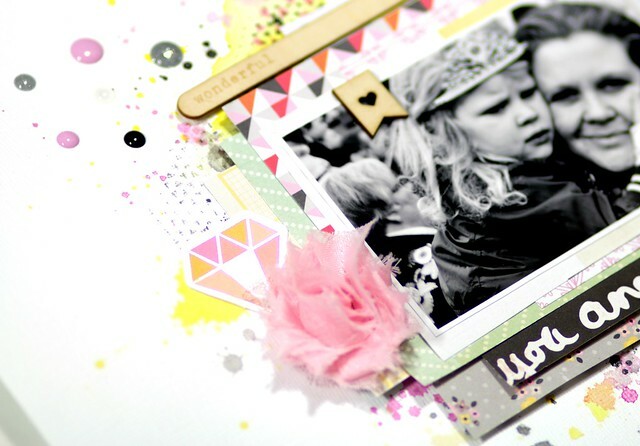 For the title I have mixed pieces from the Pink Paislee Bella Rouge ephemera. 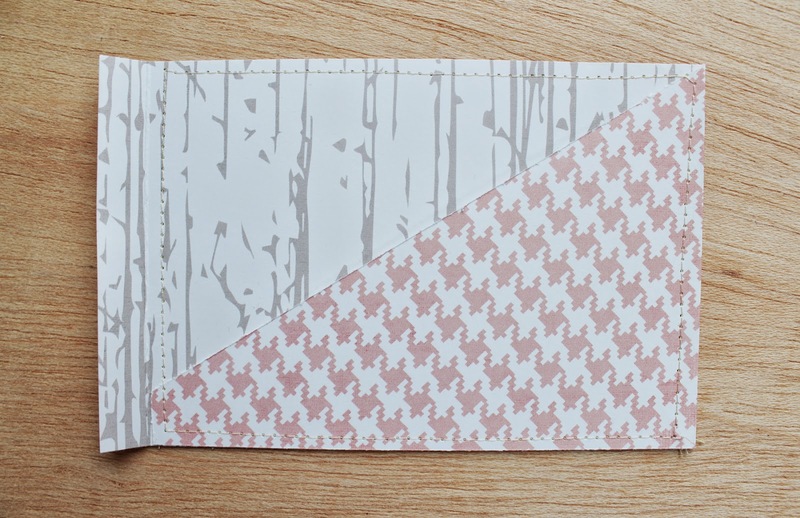 The piece magical is adhered on a heart and a square piece. 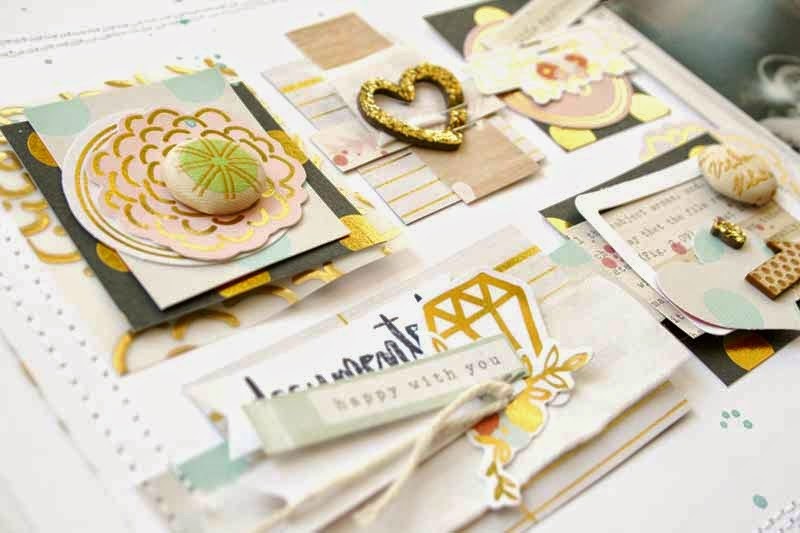 The text Love is the die Crate Paper Maggie Holmes Open Book Die Set - available in the store. 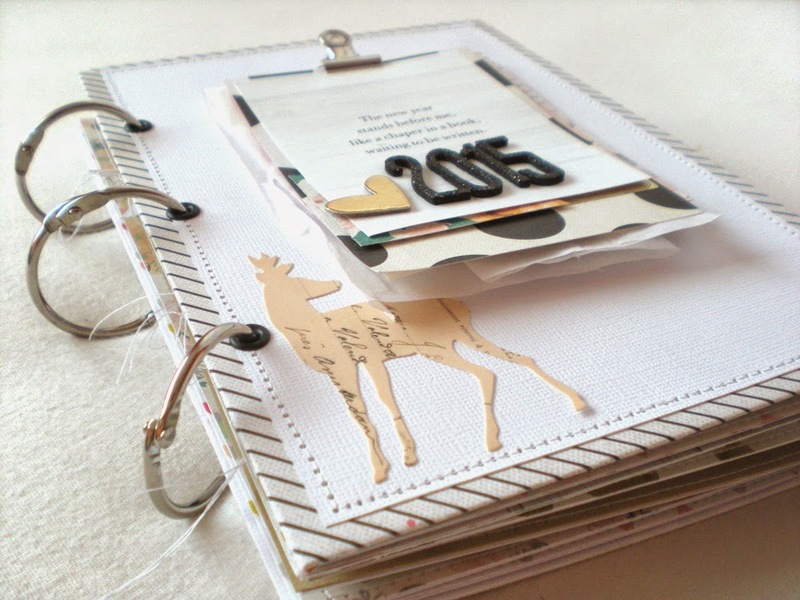 I really love the album cover that I made last year so I really don't mind squeezing in 2013 & 2014 DD pages into one album. 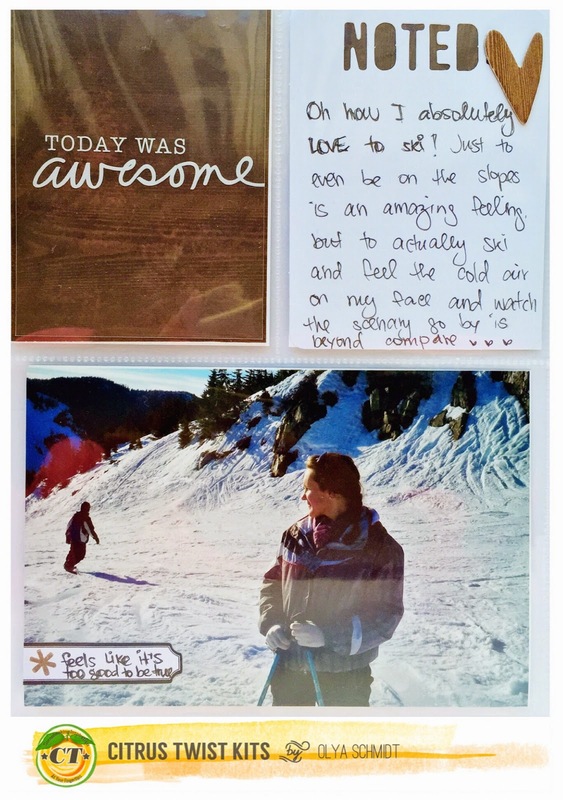 I added a post card that my IG friend sent to me. It's pretty sad this year as this is the only Christmas card I have received + I literally sent out none! Its simple and do-able right? 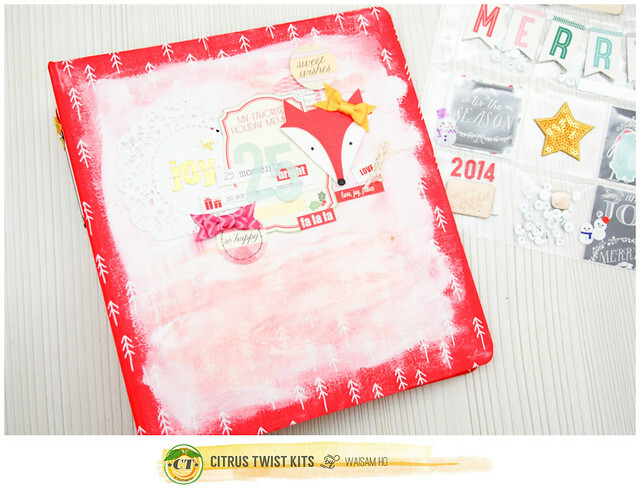 I h ope you enjoy peeking into my not-so-completed December Daily album ;) Happy holidays! I love this sketch because it is with a big photo and these are one of my favorites to create. I do not use a sketch for my layouts very often. 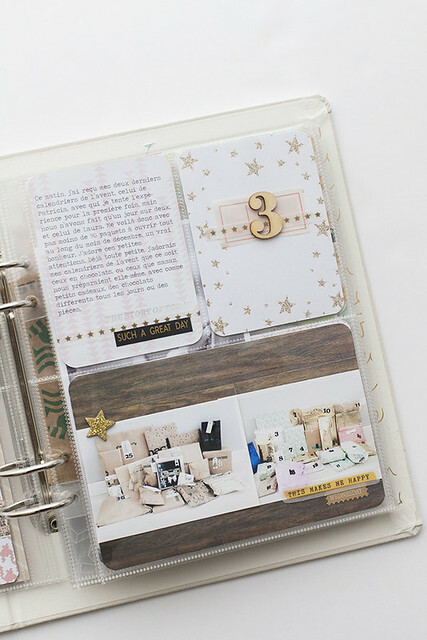 But I think it's a good inspiration for how I can place my photos, journaling or title on the layout. 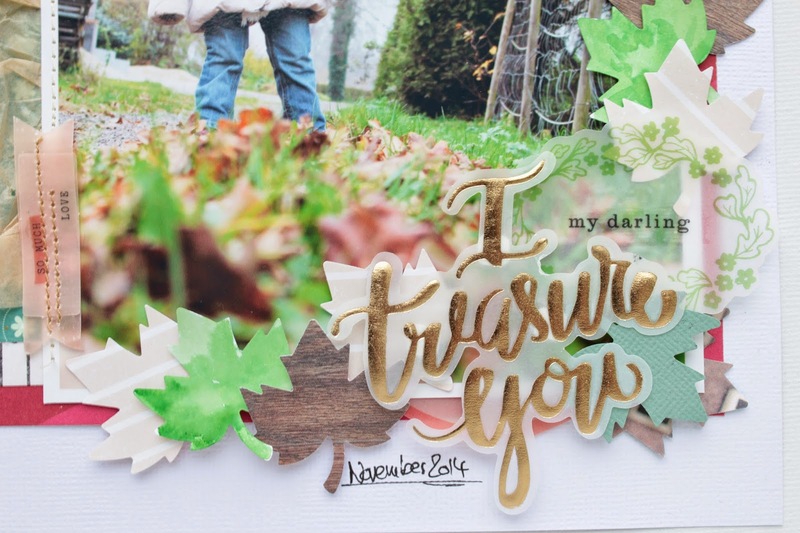 For this sketch I used a photo from November this year, so it is a fall layout. 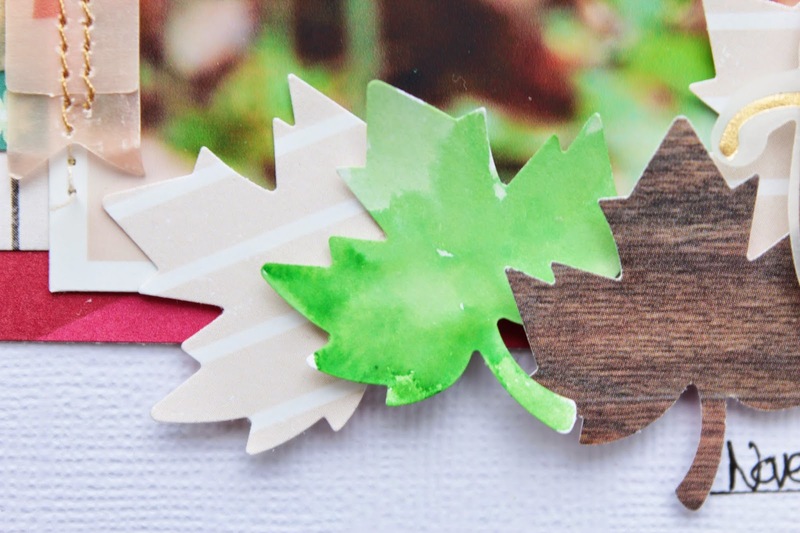 I love the idea with the layering and I made a little banner with fallen leaves. 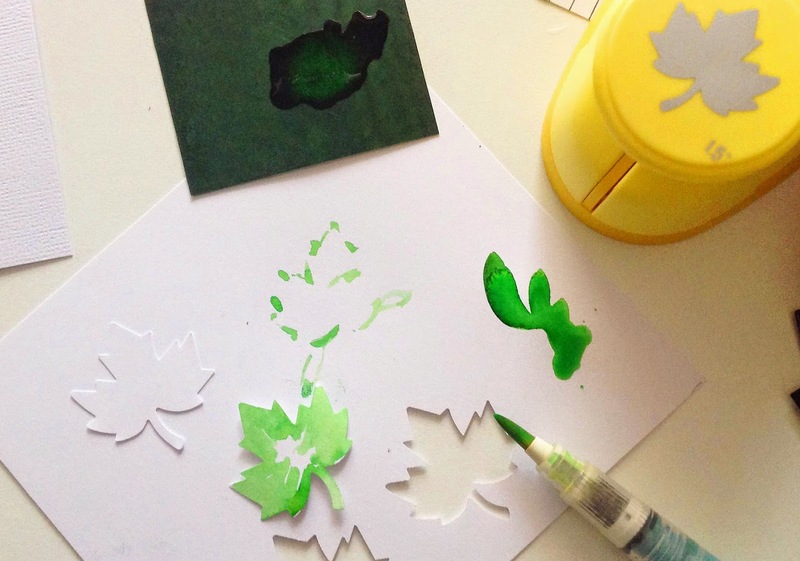 I cut them out and I painted two leaves with watercolors in the same green as on the photo. I love this combination. 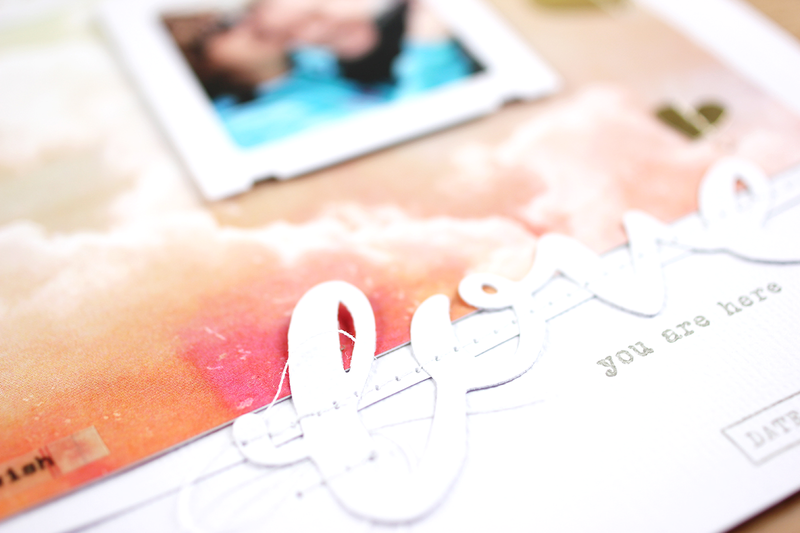 And I sewed some papers and used the cute little stamps for my layout. Now it's your turn to take on this week's sketch! 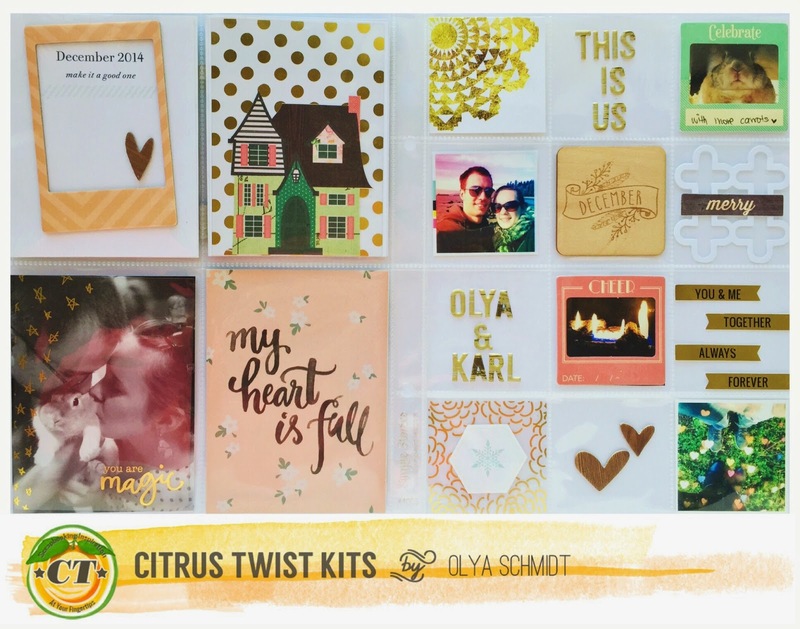 We love to see what you do with our kits and sketches so please make sure to upload your projects to the Citrus Twist Gallery. 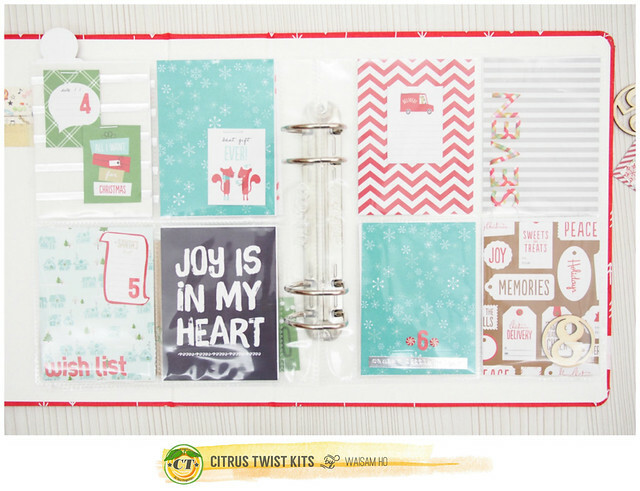 And remember, by uploading your take on today's sketch to the gallery by 12/28, you will be entered to win a $5 Coupon to use on anything in the CTK Store! Christmas is almost here ! 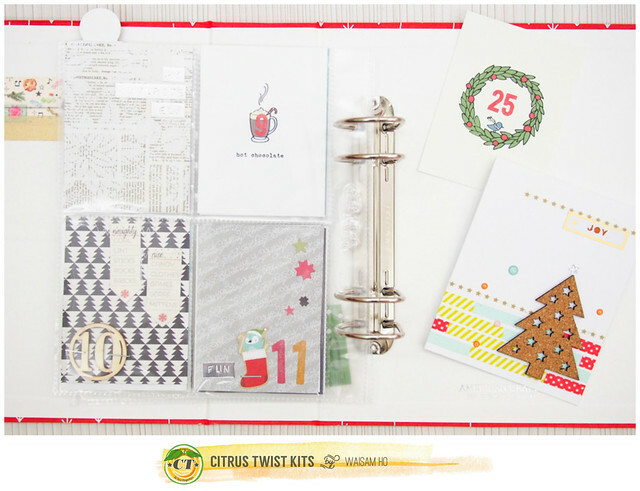 Have you work on your December Daily ? 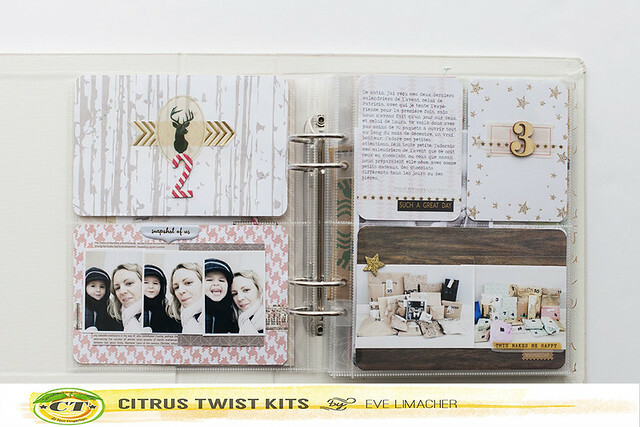 I used the main and embellishment kit to do the firsts pages of my album. Hello, Olya here. 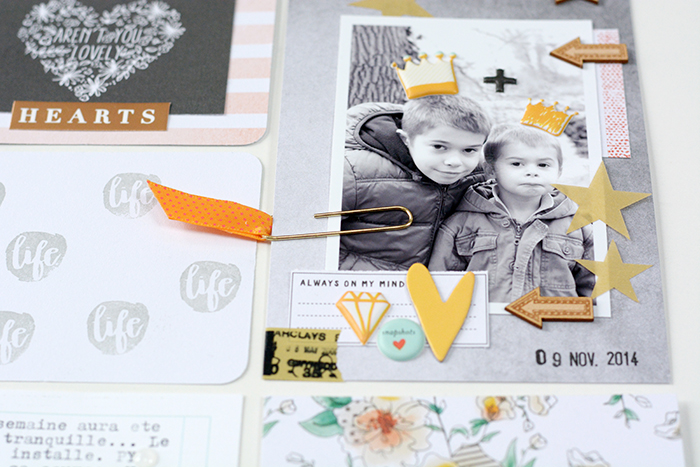 Today I'm bringing you my pages using our December Pocket Life and embellishment kits. Shall we take a look? 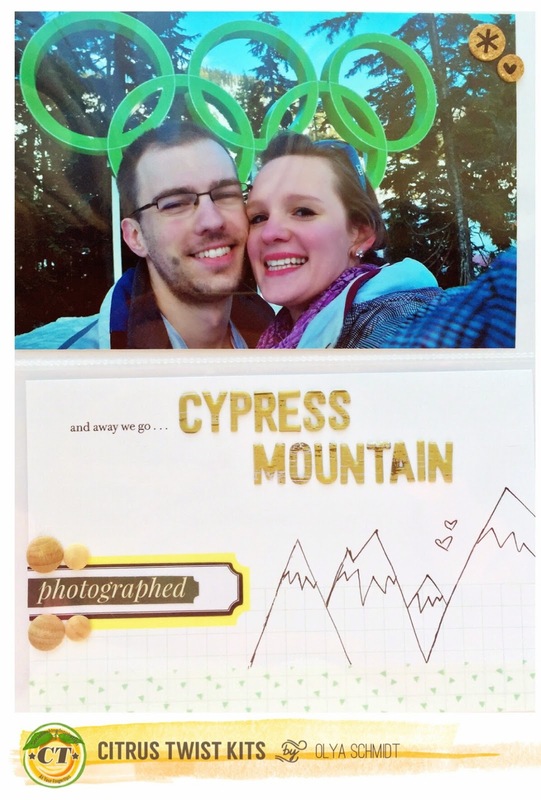 This month I used a smaller 6x8 format for my PL because I wanted to focus on telling a story of our snowy trip to Cypress mountain, home of the 2010 Winter Olympics. And here is the right hand side. 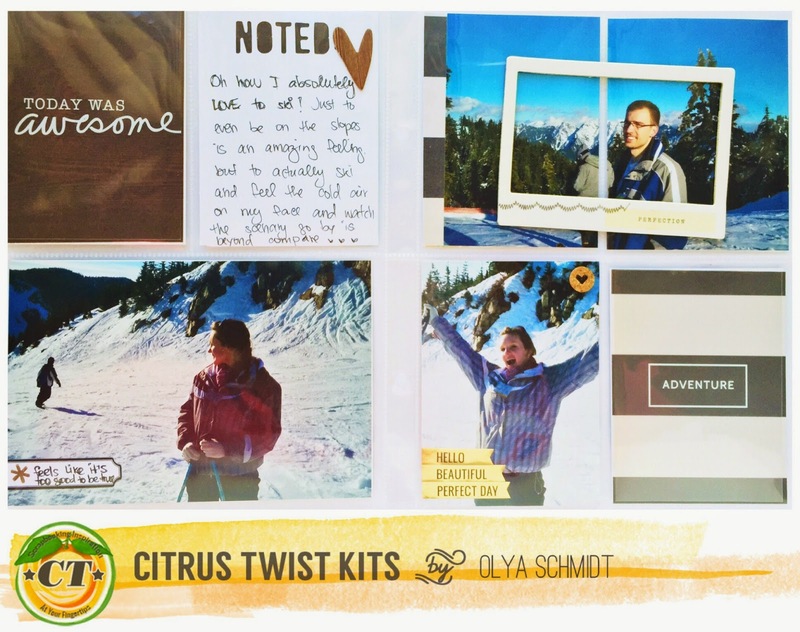 I used the Citrus Twist exclusive 'little sprinkles of love' to journal about our little trip. 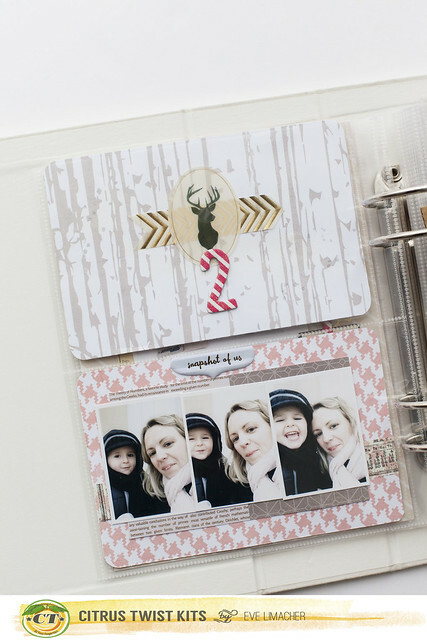 I stamped the arrow from this month's stamp set on the journaling card and added a few embellishments on the photos. 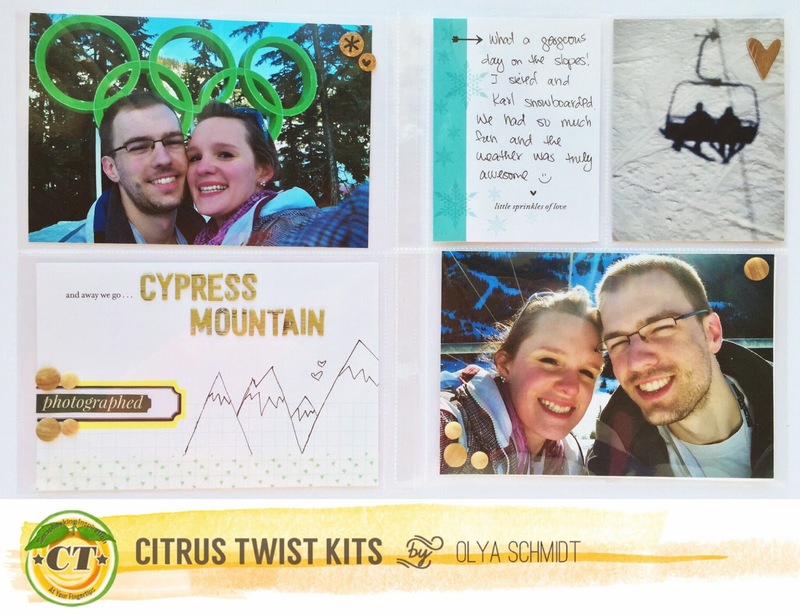 Here is another spread about our ski trip. I absolutely loved the woodgrain paper and the hearts embellishments that were included in the PL kits. Oh, and those transparencies.. soo good. Closer look at the left hand side page. And here's the right hand side page. 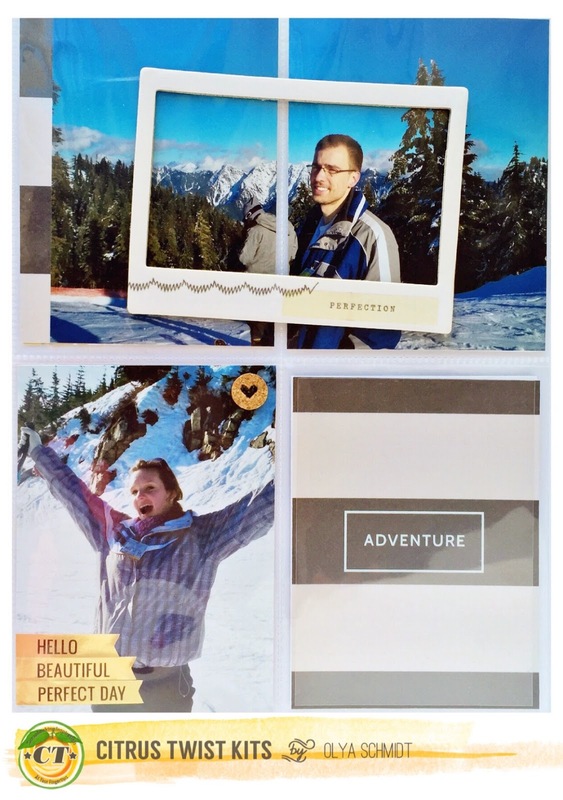 I adhered the polaroid-like chipboard frame directly onto the page protectors. 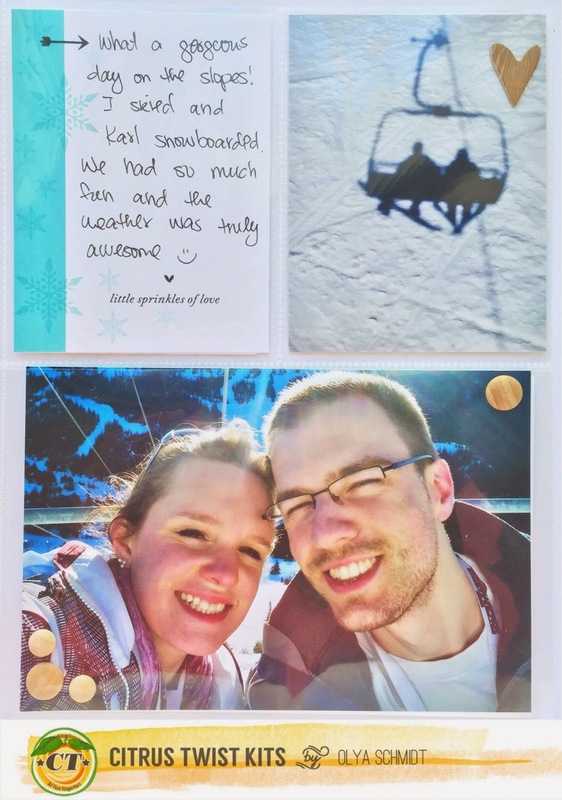 I wanted my husband to be the main focus of the photo as well as the frame to unify the 4x6 photo that I split up into two 3x4s. 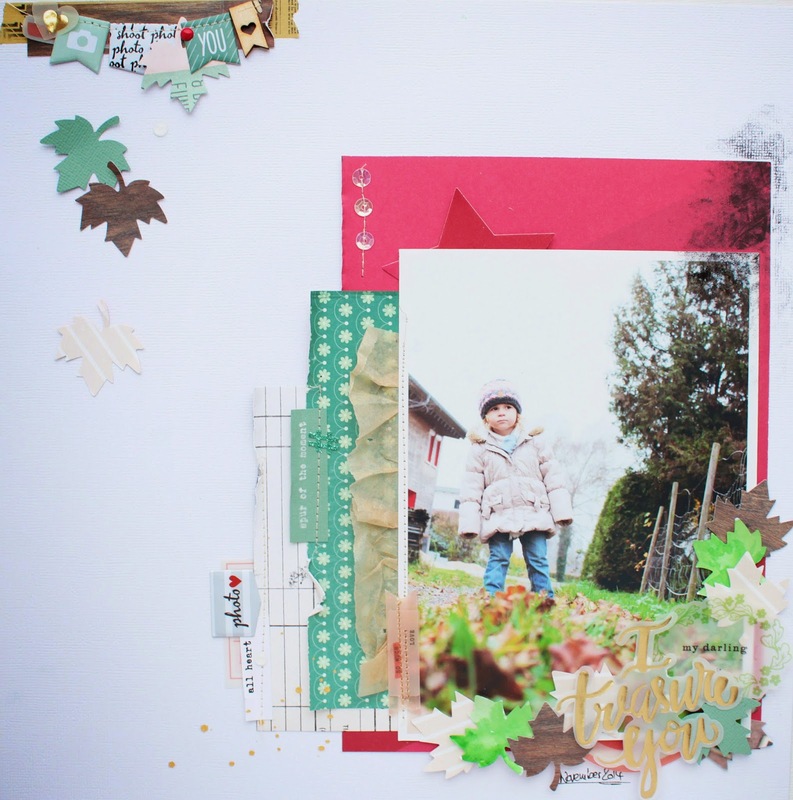 And this is my non-mountain-ski-trip spread of December PL. 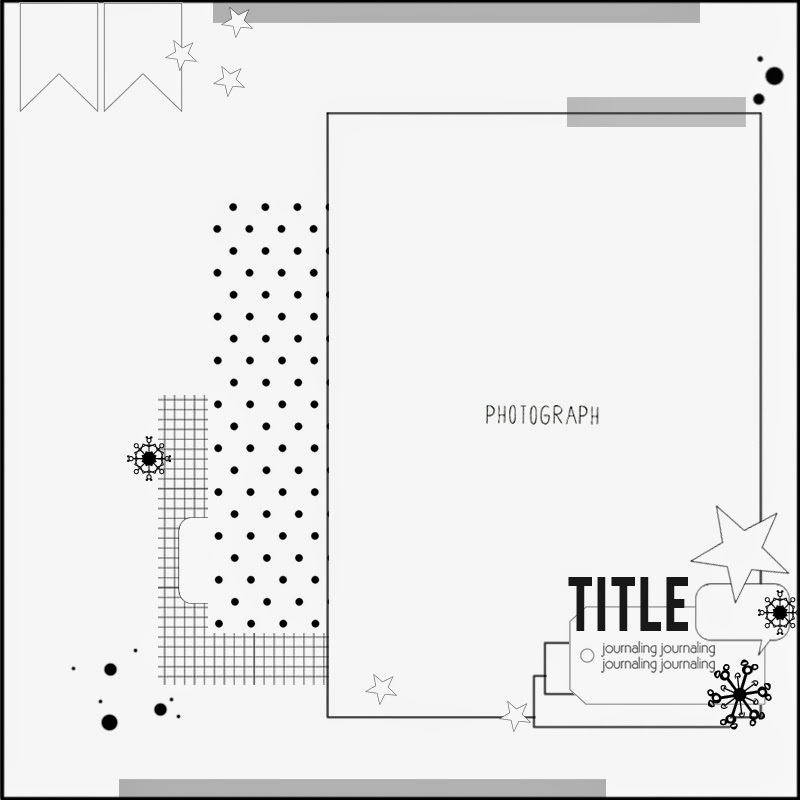 I wanted to make a grid of 2x2 squares to showcase the little December memories throughout them, as well as have fun with the amazing embellishments that were included in this month's kits. And the right hand side page, which is a 6x8 page consisting of 2x2 little squares I mentioned earlier. Don't you love that exclusive wood veneer? 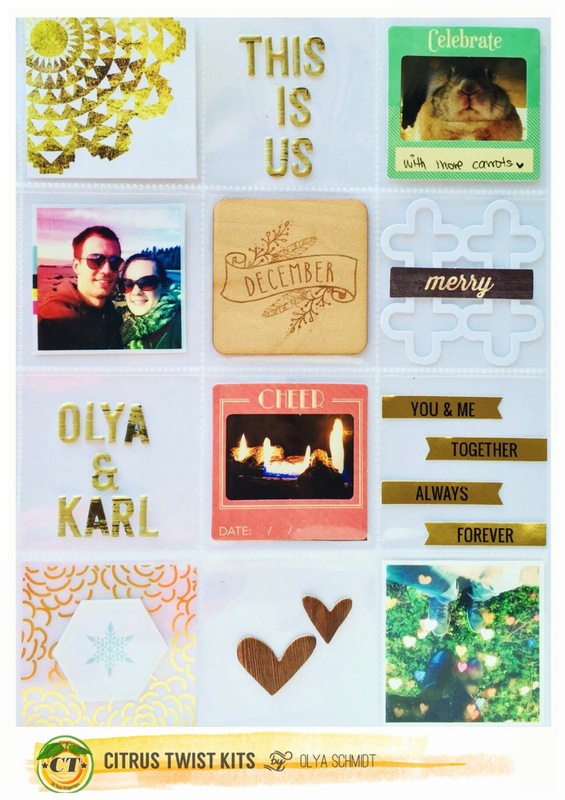 It was pretty much the jump start of the grid idea, as well as those cute photo frames. 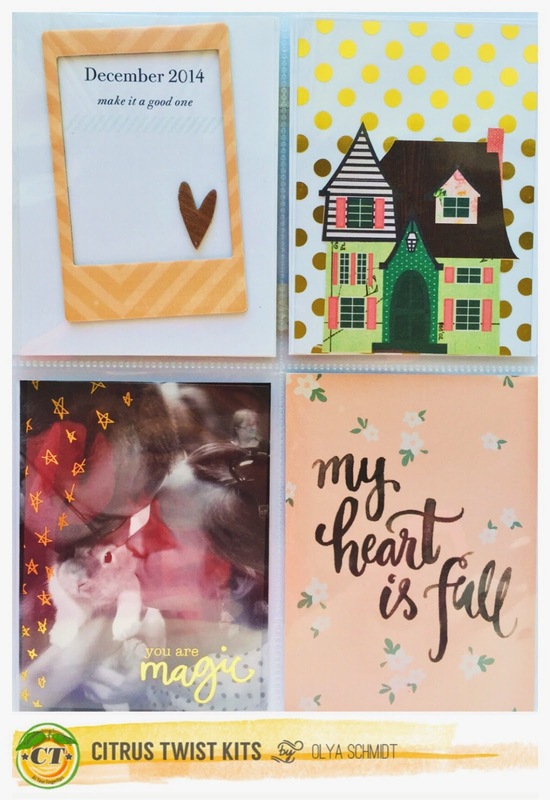 Pocket Life with Jen :: December Style! 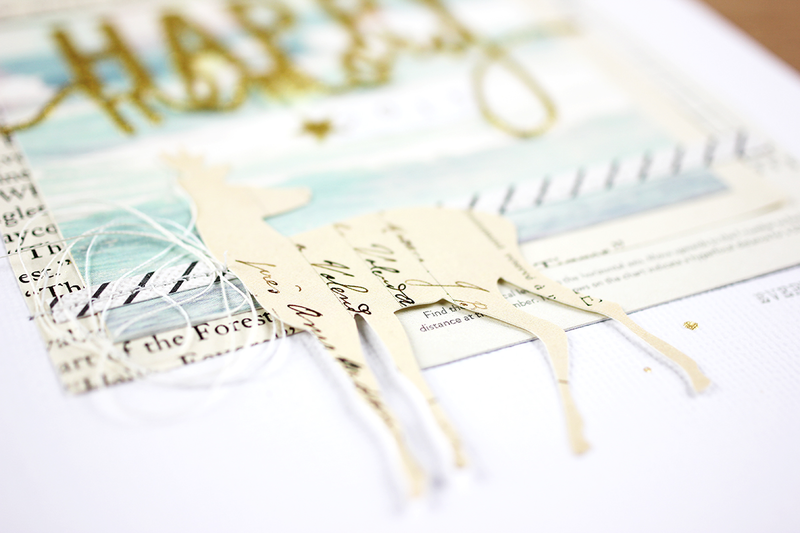 December Guest Designer Steffi Ried + Giveaway! !